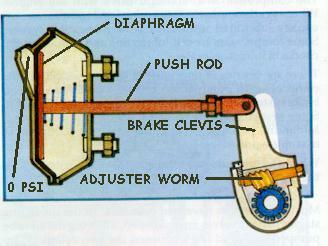 Operation of each of the components of the Air Brake must be monitored at all times. In addition, a “Pre-Trip Inspection” should be carried out before every movement of your coach. This will check the operation and security of each of the elements in the system. Upon starting the engine, the driver makes a note of the position of the second hand of his watch – or begins counting, and notes the time it takes for the air to build up to a certain value – the end of the gauge’s “red zone,” is a good one. The air pressure of the system, assuming it’s starting at Zero, must reach the end of the “red” zone of the gauge – 80 psi – within 90 seconds. It must continue to build to 120 psi, according to BC DOT regulations, within 3 minutes. At this point – and this is important! – it must STOP building pressure – ie, the regulator must deactivate the compressor and the gauge will be seen to stop climbing. If it continues to climb, there is a fault in the regulator, and the engine must be shut down and the condition must be checked. During the period of brake fanning to reduce pressure, you should also observe just how much of a pressure drop you get for each application of the brakes. How hard the application is should make little difference – the air chambers fill with a 1/2″ brake pedal movement just as much as when it’s floored. (This should NEVER be done when the spring brakes are applied, by the way – more on this later.) A drop of about 5 psi per brake application is normal. Much more than this is a sign of possible leakage of a line or air chamber. If this occurs, the operator should have a helper apply some brake while he listens at each wheel and under the bus in general for the sound of any escaping air. Once the compressor and its regulator have been checked and approved in this fashion, we may proceed with the rest of the system. The engine should then be shut down, and a “walk-around” should be done to listen for any signs of escaping air. It is a good idea to have a helper apply brake as well – 1/2-3/4″ of brake pedal is enough – while you listen for any sign of air escaping from an air chamber. Of course, if any air leak is detected, it must be investigated and repaired. Leaks may be checked for with soapy water applied with a brush to suspected joints and lines. Air escaping within a brake chamber indicates a leaking diaphragm, and this condition must be remedied before operating the vehicle. Exchange brake chambers are not expensive. If replacing a (double) (rear) Spring Brake chamber, remember NEVER to attempt to dismantle the chamber! Now for the slack adjusters – these must be checked before every trip, and of course adjusted if necessary. Once the safety considerations have been met, it’s time to check the slack at each adjuster. Truck supply houses sell a “Brake Buddy” (TM) – a special wrench with a fitting to allow it to be used as a lever on the slack adjuster. These are a handy thing to have in the tool box – with your tire pressure gauge and tire beater. If you don’t have one, you’ll have to move the slack adjuster some other way, but the object in any case is to move the slack adjuster at the pushrod end back and forth, checking the distance it moves at this point. The slack should be set to 1/4.” If it moves more than 1″, it must be tightened. This is accomplished by rotating the adjuster worm, by means of the adjuster bolt, about the pinion gear until all slack is taken up, then backing off on the bolt until there is 1/4″ of free play. The Slack Adjusters and Brake Chambers At Their Limits Of Movement. Brake Off. The only way to tell if this brake is sufficiently tight is physically to move the slack adjuster lever until movement is stopped by contact of the shoes against the inside of the brake drum. As movement approaches 1″, adjustment is indicated. Brake Full On. This brake is too slack – it should NEVER be possible for the diaphragm to reach full distension. 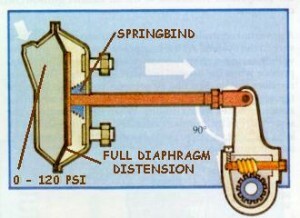 Spring bind in the return spring prevents any pressure from being exerted against the brake shoes. Furthermore, even if the brake is operating at this point, there is no “wiggle room” for brake wear or fade. Danger Alert! – Reversing Adjustment! NEVER count on simply tightening up the adjuster bolt, and then moving it back a half-turn! It is possible that an adjuster has been installed in such a way that clockwise “tightening” of the adjuster bolt may in fact be LOOSENING! Hence, the misguided operator may be taking the adjuster to Full Loose, then tightening a half-turn, which is obviously a waste of time and a huge danger! Some slack adjusters may be fitted upside down or inside-out, and this condition will then attain. Following the correct procedure will cause the pushrod to move INTO the brake chamber when tightening – although usually an imperceptible distance. If your “tightening” results in the pushrod moving OUT OF the brake chamber, they you’re going the wrong way! Then a 1/4 turn in the opposite direction will provide the proper slack. The slack MUST ALWAYS be re-checked after adjustment by physical movement of the slack adjuster and pushrod. A further check may also be useful: if you have an assistant make a light brake application while you observe the action at each brake, you should see only 1/4″ of movement of the pushrod and adjuster end after adjustment. If this method is used as a pre-adjustment check, be sure to re-adjust (and re-check!) if observed movement is approaching 1″. Care must also be taken to ensure that there is adequate pushrod slack. If the brakes are set too tightly, they can drag – a partial application at all times, even when not applied. This will result in overheating causing Brake Fade, so they may not be there when you need them. That 1/4″ of slack is there for a reason! The brake chambers exert the greatest mechanical advantage against the slack adjuster levers when the angle between the pushrod and the lever is 90 degrees. Consequently, when new brake shoes are fitted, the pushrod length is adjusted so that this angle will be just a bit over 90, and as the shoes wear (this wear of course being compensated for on a daily basis by slack adjustment), the angle at the point of contact will become a bit short of 90. This compromise must be readjusted so that the angle at full brake application is as close to 90 degrees as possible. This is accomplished by physically changing the length of the pushrod with the adjustment provided. This is not a daily procedure, but it should be monitored and corrected as necessary. Since the Spring Brakes are an integral part of the rear brake chambers, when the rear brakes are adjusted, so are the spring brakes. ie, they require no further or special adjustment. As a compressor makes air for the system, it can also add oil and water, through condensation, to the air supply. If this water is allowed to remain, it can result in rusting the tanks and lines from the inside out – very insidious! – and generally act to detriment of your brake system. Oil, from compressor piston ring leakage, is even more deadly – it can bring about rot and deterioration of the rubber parts, such as the diaphragms of the brake chambers. Another problem with water buildup is that, in cold conditions, it can freeze in air lines and/or brake chambers, preventing the proper operation of the brake system. For this reason, air-braked equipment in cold climates (greater condensation due to temperature differences) often include an air dryer in the system. For this reason, the Wet Tank – the first of the two reservoir tanks – should be drained at the end of each days operation. There is a valve at the bottom of the tank, and popping this valve will result in the expulsion of a good deal of air, carrying along the accumulated water and oil at the same time. Don’t do this in a friend’s driveway – it can be quite messy, although if your compressor’s in good shape, in regular temperature conditions the daily buildup isn’t much. Brake shoe wear should also be monitored. Most vehicles require periodic removel of the wheels and brake drums so that the shoes and drum surface may be inspected for wear, and this is a good idea with the Flxible Clipper brakes as well. However, on most models, the brake drums are open enough so that the shoe thickness may be monitored to some extent. The thickness of the brake lining riveted to the brake shoes should not be allowed to reach less than 3/16″. If lining this thin is detected, proceed directly to a reliable truck brake repair facility for lining replacement. Have the front wheel bearings repacked at the same time, of course, and the drums inspected carefully for excessive wear, cracking, or any other defects. Do not rely on difficulty with brake adjustment to tell you it’s time to replace your brake shoes, although this may sometimed also be a problem indicating a need for replacement.